Many people come to Hawaii hoping to see a lava explosion or lava flowing out of the volcano. The only island in Hawaii to see any kind of lava activity is the Big Island. But going to watch a lava flow is not as easy as it looks. It’s not predictable how much seismic activity there will be. 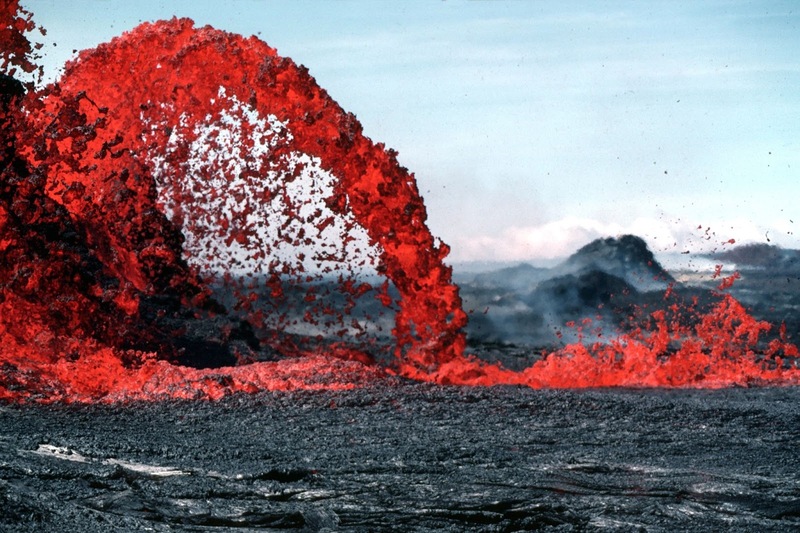 The lava also changes its direction, and where it flows out of and flows to. It’s kind of like predicting the weather. Pay for a helicopter to fly you over the volcano or over the lava flow. Depending on how active the lava is flowing in that period, it might be wonderful, or not very exciting at all. Usually, tour companies will try to only book when the lava is actively flowing. It used to be $300 per person (for a volcano air tour from Maui to the Big Island), but I’m sure it’s more now. If you're on the Big Island, I'm sure it should be less. This is relatively safe, as long as the helicopter does not crash. Second way, find where the lava is flowing and hike over miles of lava rocks to see it close up. Yes, I said miles. How many miles? Could be 2 miles today but oh, maybe 4 miles tomorrow. Maybe it’s 5 miles. Remember the lava flows and can change direction daily. This is the do-it-yourself approach. In the Pahoa area, south of Hilo, sometimes there are cars parked by the side of the road near the closest access point to active lava. People will hike out to where they THINK the lava is flowing or near where it WAS flowing yesterday or where other people SAID it was flowing earlier, to see it for themselves. I’ve also heard of lava tour guides by the side of the road who will guide you to where the lava is flowing. How close can you get to the lava flow? I don’t know since I haven’t actually done it. Last time I was on the Big Island, there was not enough time to get there and back in one day. The other danger is getting too close, even if you’re several hundred feet away. Where you are standing could be still be unstable and fall into the ocean. This is not good for your health. Another problem is that after finding and watching the lava flow, it is very hard to go back in the same direction to where your car is parked. Even the most farsighted person will not be able to see his car miles away. Some people have solved this problem by putting up something high like a pole with a bright flag on top of their truck so that they can see it in the distance. I have also heard stories of people wandering around for days looking for their vehicle. The third way is to find out from the National Park Service where the lava is flowing into the ocean from a SAFE distance. This is something I have done. It’s still very cool to watch but it’s far away. But it's safe and you won't die from the lava. 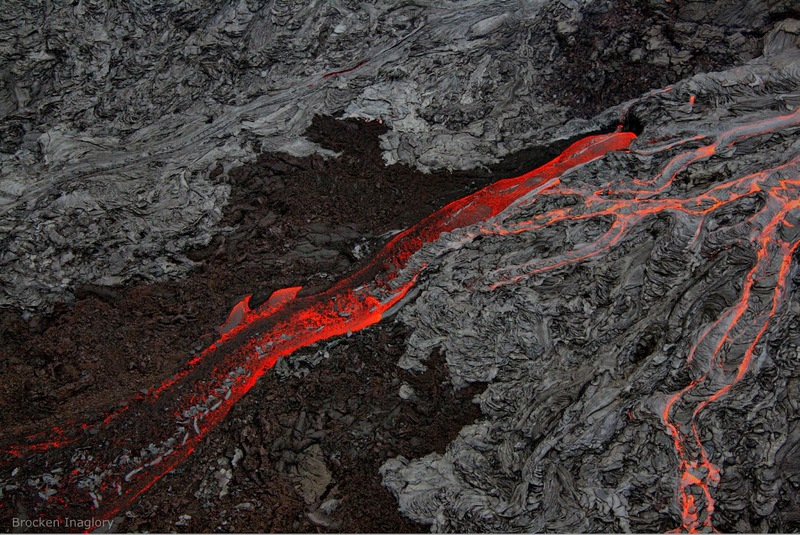 There are two main kinds of lava: a’a – a sharp jagged lava and pahoe’hoe a smooth undulating lava. Why is it called a’a lava? My husband claims because it’s so pokey, you cry out “ah ah” in pain. Pahoehoe lava. Very smooth looking. Public domain photo by US Geological Survey via Wikipedia Commons. A'a lava. Pokey, loose, rough, jagged stuff. This is from a lava flow on Maui, at the Ahihi Kinau Natural Preserve (aka La Perouse). There are also different kinds of things you can find in the lava like Pele’s hair, long strand-like formations of glass; Pele’s tears, tear shaped pieces of lava; and also little pieces of peridot or olivine. The peridot on the Big Island is not really gem stone quality. It is considered bad luck to remove any lava rocks or other things found in the lava from the islands. You can read more about this in V for Volcano, last year’s post. Pele's hair, golden strands of glass. Photo by DW Peterson for USGS. Public domain. Can you really get close to lava? Can lava kill people? 1. You can move faster than lava. Lava is pretty slow moving here. This is not the kind of volcano that destroyed Pompeii. 2. There is plenty of advance notice when lava is threatening to flow into your neighborhood. Some people do live in areas with active lava flows. Those houses are often less expensive. Gee, I wonder why. Most people do evacuate, but inevitably one or two people will stay behind, insisting that the lava will flow around them or that if not, then it was their time anyhow. 3. 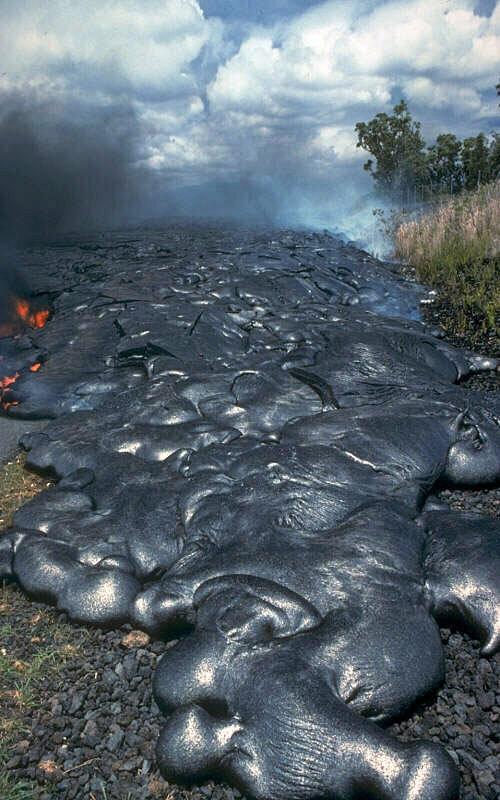 It is very hard to get close to lava unless you are a geologist. Usually the access is blocked. They don’t want tourist casualties. But I have one friend who used to live on the Big Island. She belonged to an artist group that was allowed to get really close to the lava flow so they could dip into the hot lava to make art. I don’t think the state allows this anymore – too dangerous and there are too many lawyers these days. Lava and the smoke and ash during and after a lava flow can be very hazardous. 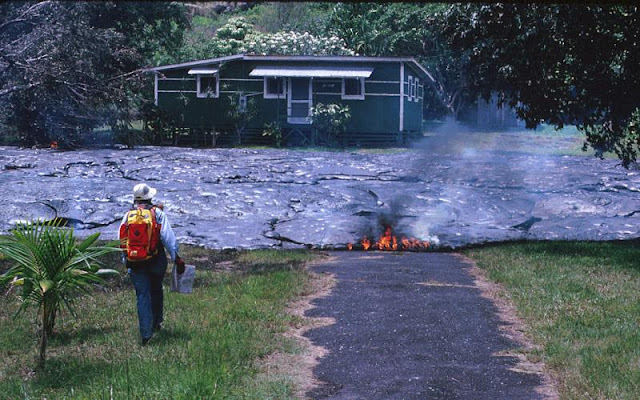 The USGS has a website of the hazards of lava flows. There is so much more I'd like to say about lava. But I have to stop writing! OMG how scary...I think I'll pass on that particular activity. I can't believe people live in areas where their homes can be wiped out by lava. so much to learn about lava! i love the pic of it in the road! Most interesting thank you! Beauteous to behold but I am sure I wouldn't want to get to close. Fascinating post about Lava, one of the things I'm enjoying about visiting the A to Z bloggers is all the different topics I'm stumbling across. Yes, so many different topics! Maybe one day! Not the crashing or having an accident, but the lava watching part! There's too much to do in one trip! There is seismic activity on the islands! But not usually due to lava. Or not that I'm aware of. We had a small earthquake a couple of years ago that damaged a few foundations of houses. You're welcome. It's exciting but dangerous! I've enjoyed reading your posts too.